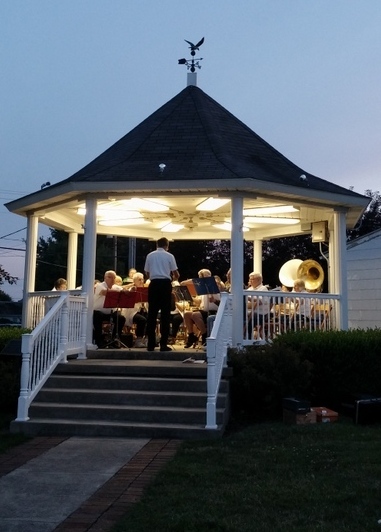 Wednesday nights in summer we'd all head down to the Gazebo in the middle of Monroe Park to hear the open air concerts. The band consisted mostly of our fathers and grandfathers and truth to say, nobody was all that good. But the music was sweet, the nights were warm, and frankly there wasn't much else to do in the town. All of us assumed it would last forever. Now years later there hasn't been a concert since anyone can remember and all the band member have passed on. Even the Gazebo is gone, replaced of all things by a McDonald's. Now I can get me a Big Mac any time I want. This is way better than those lousy concerts! I was going to go serious until the last minute when I lost my nerve and nose dived into a virtual promo for McDonald's. Thus my contribution this week to the Friday Fictioneers consists of this lovely bit of nostalgia which reads more like nostalgia for an Egg McMuffin than for band concerts in summer. Click here for more palatable and tasty weekly fare from the other Friday Fictioneers. Do you yet hear the music from long ago and far away? Me neither, let's eat! The nose dive was spectacular! Mac's are better than your old folks at home music? Shame on you. Not funny at all. You have stooped to the lowest point in your career, Perry Block. Other than that, life is good here in Monroe Park. Think so? I have not yet begun to stoop! I truly thought you were going serious on me than BAM! the last line let me know it was truly you. Fun story, as always. I almost didn't recognize you without your orange afro, clown nose, and oversized shoes. Your Big Mac has been downsized and the Ho-hum Meal is being phased out. I'm lovin' it. I was just funnin' ya that I wasn't funnin' ya. However, real situations like this do make me sad and nostalgic, which maybe is why I'm compelled to derail them here. But I still have the clown nose, all right. And my Big Mac is not the only thing that's been downsized and in the process of being phased out. Okay, let's go hear some music at the gazebo now. A wholesome remnant of real America. Of course who am I to define real America as it means so many different things to different people. But I still have a distaste for what America is today. Not that long again (about 15 years ago), I took my boys to see the beautiful town square in the old town in Texas that I grew up in. -- -- Yep, you guessed it. No town square. Just junk buildings. Old baseball field was gone. The new swimming pool was filled in (concrete edges still showing). Wished I hadn't gone back and, instead, gone to McDonald to see you and then to Burger King to see Russell's new costume, ha. Perry Perry Perry, you know at our age a little dancing in the gazebo is much better than McDonald's! McDonalds is like a disease. It even infects FF. You saved the day with big Mac ! Have you no soul? You can get a Big Mac anywhere - if your stomach can cope - but music is soul food. Ohh! Just as I was losing myself in your idyllic, nostalgic scene, the carpet was pulled from under my feet and I'm left to contemplate a Big Mac!? Really? You would prefer Chicken McNuggets? What? You don't like reality shows, important statements by world leaders issued in tweets, and a culture that devalues anyone over 30? Actually ... me either. That's right! I've been waiting for you here at the McDonald's and Russell is waiting at Burger King. If you take any longer, they'll probably tear them both down and build a park and a gazebo! Thanks, Mike. As I read, I'm thinking, aw, such a sweet and wistful story. Then, wham, you hit me with the Big Mac! Could I get a hot apple pie with that? Nicely done. Ha.. And that is how we create growth in the exconomy. What I know at our age is regardless of whether I dance a bit or eat a Big Mac I still pretty much won't be able to get up until the next day. Yes, nurse, it's time ... hand me the knife ... I'm going in now ... everything will fine, you'll ... there it is, I'm cutting! Okay, I'm cutting up the Egg McMuffin now, here's your portion, nurse! Not really. I didn't save the day, I trashed the town. Big difference. Yeah, pretty much I have no soul. I think that's gotta be it. Now if you don't mind, Satan is waiting for me. Thank you, Rochelle, it was a sweet wistful story, wasn't it? Even I was enjoying it and I almost hated it when it came time to totally trash it. Thank goodness for the sensitive writers like you! I think it's a terrible thing, but hopefully a funny thing. Most readers so far want to lynch me. Exactly. It's not about sensitivity, memories, and caring. We gotta make bucks here! I want you to know I was right on the edge of writing a sensitive piece in which the protagonist returns to the park and feels the pain of his childhood diminished and .... I couldn't do it. Maybe next time I'll write about the Grand Canyon and play it straight all the way. It would make a great site for a casino! Lovely, funny story. Well done this week. Gee, I've never been compared so favorably to the Joker before! Thanks, Doug. What a sweet nostalgic story. Then bang! Trashed! Can I get fries with that? Sure. Always happy to fry a reader's arteries. I doublechecked if I was really visiting your blog and Baam! There you were, last sentence. Afraid so. Some day maybe I'll grow up.